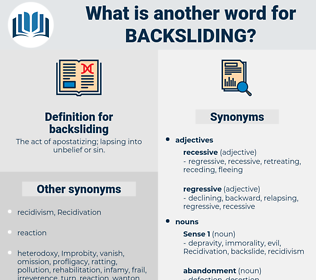 What is another word for backsliding? The act of apostatizing; lapsing into unbelief or sin. re-offending, decline, reoffending, retreat, backspace, deterioration, recidivism, downturn, slowdown, recurrence. 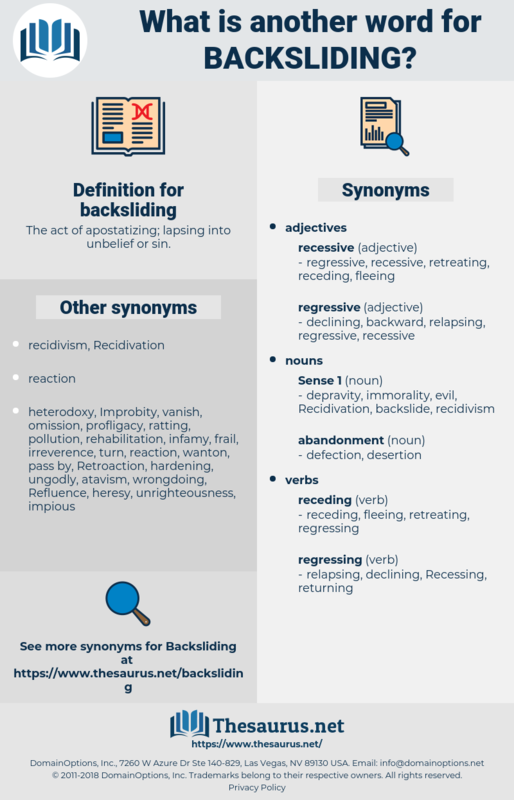 retrogression, relapse, regression, setback, backtracking, regress, reversal, slippage, kickback, climb-down, rollback, backlash, decrease. Meantime the other special envoy had made his appearance in the Netherlands; the other go - between between the incensed Queen and the backsliding favourite. If change of conviction or backsliding occurred later on, that was not their business!